If you’re a writer who sticks to using Microsoft Word or another typical word processing program, you may be missing out. I managed to snag Scrivener for a great price late last summer, but admittedly never took the time to get to know the program before it got lumped into the “stuff that isn’t as easy as Word” pile. How wrong I was. If you do decide to get Scrivener, or you have already but didn’t think you liked it, my one piece of advice would be to browse through the interactive tutorial and then click and right-click everything to see just how much you can do. While I greatly admire the sort of person who can write their stories in perfect order from start to finish, that is the opposite of me. I have tidbits, pieces, chapters, and random scenes all over the place, all of them in various vaguely-named doc files and folders scattered across my hard drive. Some of these files are just a sentence, or even a fragment. Scrivener has been a huge boon to my productivity for this very reason, because I can finally compile all of these pieces into one easily-accessible place. A simple click of the “full screen” button takes you to your writer’s retreat. As someone who is very easily distracted by the internet but still needs Pandora to get anything done, this is a really helpful feature. The bottom menu in the screenshot retracts until you need it, but I wanted to display the different options you have, including setting the scale and width of the page and the opacity of the background. There is a lot you can do to customize your workspace, but this is one of my favorites. I spend a lot of time in front of my computer screen, and black text on a white background can be a huge strain on my eyes after a while. Setting a darker or more neutral page color can help save your eyes, or you can try a little color therapy to get you in the right mood for a particular scene. Click the little target/circle icon in the bottom right of your project section to get this menu. 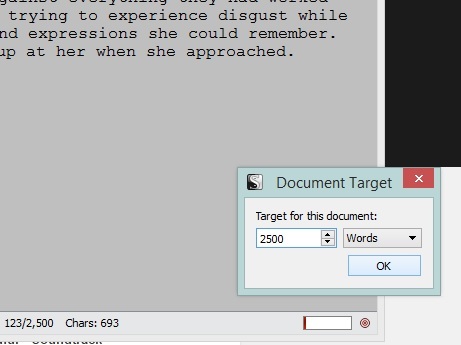 Targets are set per section, so you can use it to set yourself a goal per chapter, or even per writing session. Once a goal is set, the status bar to the left will show your progress. These are just a few of the many great features in Scrivener, and I’m sure as I continue to explore this program I’ll make more discoveries to share. Do you use Scrivener or another writing program? What are some features you can’t live without? This is from a fellow member at Authors’ Cave, Mary Fonvielle. I am one of those people who set Scrivener aside as ‘harder than Word.’ I am willing to give it another try. Too many of my fellow authors swear by it. You won’t regret it! Definitely take the time to use their interactive tutorial, it made everything a lot easier. I use this application as well. Best investment in learning time I’ve spent in a long while. Some nice tips in this post. 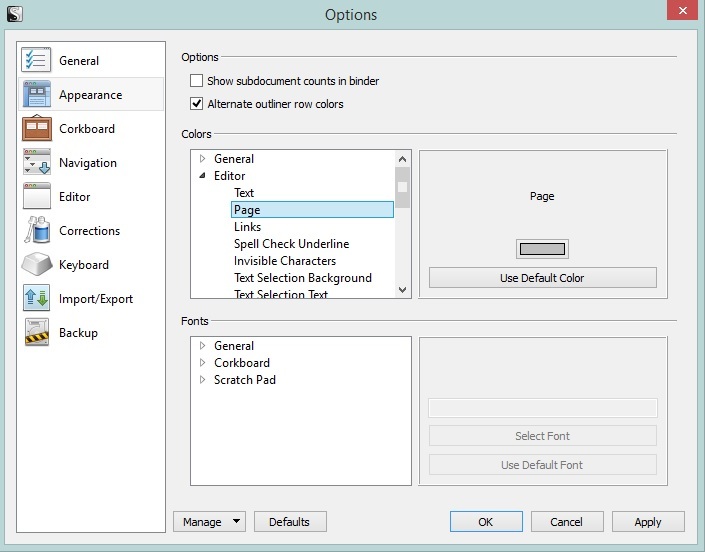 Before diving in, make SURE to watch this intro video from the scrivener folks. JUST this video. Play with the application based on this video FIRST, and then move onto the more advanced topics AS NEEDED. The coolest feature of this application is that you can dive as deeply as you want…OR NOT, and it still is far better for writing projects than just about anything I’ve ever used. Thanks for the tip! I actually missed the video, but I’ll be sure to check it out.